The Week in HD - Monday 23rd September | What Hi-Fi? Joss Whedon's much-awaited return to TV is in full force with Marvel's Agents of S.H.I.E.L.D. series starting on Channel 4 this Friday, The IT Crowd is back for one final episode, and BBC2's Peaky Blinders is fast becoming one of my favourite shows on TV. Brand new series 27, with the lovely John Hannah as guest host. Noel Fielding and Phil Jupitus return as the team captains, with Basement Jaxx's Felix Buxton, Aluna Francis from AlunaGeorge, Hairy Biker Dave Myers and comedian James Acaster as this week's guest panellists. Sweet Dough. Paul Hollywood, the master of the eight-strand plaited bread, devices a twisted loaf technical challenge for our bakers, after a home-inspired signature tea loaf. The showstopper is a mighty, delicious 36 buns creation that can involve any sweet dough, from French brioche and German schnecken to my personal favourite, Swedish cinnamon buns. Yum. Two bumbling council workers find themselves embroiled in a deadly kidnap plot by way of mistaken identity - but with added hilarity. When Sam (Matthew Baynton) answers a ransom call meant for someone else, his friend Phil (James Corden) insists they should get involved and save the day. Written by Corden and Baynton, the new comedy thriller also stars Sara Solemani, Steven Campbell Moore, with the promise of Rebecca Front, Dawn French and Emilia Fox in future episodes. The special Science Britannica series continues with its exploration of 350 years of British science. From Sir Isaac Newton's discoveries to Alan Turing's wartime code breaking to hydrogen explosions, we learn about the eccentric and visionary British scientists who played a pivotal role in modern science. 'Get yourself a decent haircut, man. We're going to the races.' So ended the last episode, and sure enough, we're at the fancy Cheltenham races tonight so that Thomas Shelby can get closer to racehorse betting kingpin Billy Kimber. Meanwhile, a couple of IRA sympathisers put in an offer for those stolen guns. Joss Whedon's back on TV! For someone who grew up on Buffy the Vampire Slayer and Angel, and still bemoans the cancellation of Firefly, this is happy news indeed. And will be for Marvel fans, too. 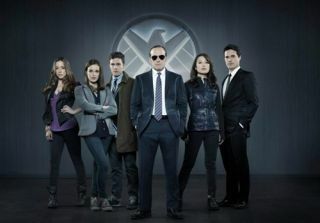 A spin-off of The Avengers film, the TV series focuses on the mysterious organisation S.H.I.E.L.D. (Strategic Homeland Intervention, Enforcement and Logistics Division), and the small team of agents recruited to deal with special and strange cases. Heading the division is the star of the show, no other than Agent Couldon (yep, he lives! ), while Cobie Smulders reprises her role as Maria Hill. We can't wait to fall in love with a whole new cast of characters, incuding Iain de Caestecker, Ming-Na Wen, Brett Dalton, Chloe Bennet and Elizabeth Henstridge. Stay tuned after the Whedon-Marvel fest, as Roy, Moss, Jen and Douglas are back for a final, one-off episode of this hit comedy show. Written by Graham Linehan, we bid farewell to our favourite IT department with one last round of misadventures. Starring Chris O'Dowd, Richard Ayoade, Matt Berry and Katherine Parkison. Knits & Knots. Stephen Fry and Alan Davies are joined by a fantastic line-up tonight: Sue Perkins, David Mitchell and Ross Noble. The Earth Bull. A new BBC fantasy series to occupy the mid-Doctor Who season lull recently vacated by Merlin. Set against the backdrop of ancient Greece, our hero Jason goes in search of his father, but washes up on the shores of the great lost city of Atlantis, caught in between mythical creatures, oracles and a deadly ritual... Starring Mark Addy, Juliet Stevenson, and Jack Donnelly. Yes, it looks silly, but let's hope it's just as entertaining. Dara O Briain delights a sold out Edinburgh Playhouse audience with his razor sharp wit, intelligent observations and hilarious audience interactions. From the man who gave us Life on Mars, Hustle and a hundred-odd episodes of Eastenders, Tony Jordan has penned yet another crime drama set in a grandoise version of London. Judge Gina McKee tips off three undercover agents whenever a criminal escapes the justice system via various loopholes. Not quite cops, the trio trap the criminals 'by any means' necessary. In tonight's episode, a young girl is murdered in what looks like an open and shut case, but the judge senses a disturbance in the case.